Fishing in Ft. Lauderdale continues on the erratic side for most Pelagic species. There are few Sails in our area and other than a one day bite in deep water, and only an early bite at that, they are difficult to find. We again continue to chip away at the Kings typically managing a few for our clients. We have managed to land some Mahi-Mahi but they are not an everyday catch. Small bunches of them and still moving fast and you need to be ready for the opportunity when you find them because unhooked members of the school even though they are following up behind hooked fish to boat side are quick to move on. 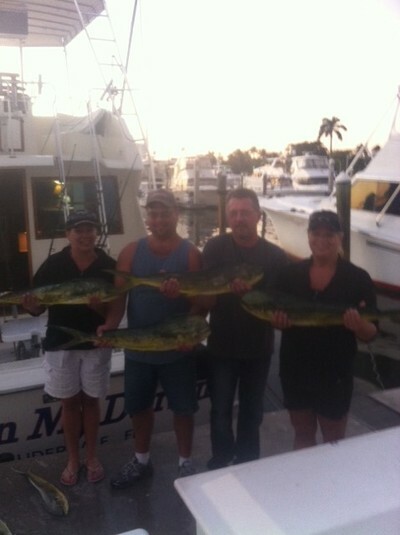 Pictured are Brian, Jeff and their wives with some Mahi on a half day charter aboard Marlin My Darlin. We are doing quite a bit of trolling as opposed to live baiting as it is still producing more fish, including some Blackfin Tuna. The live baiting while it can pay off has had some long lulls in the action and lots of small sharks ( under 40 inches) helping themselves to any live bait they see. Actually caught the same shark twice yesterday. That has happened before. Haven’t caught the same shark three times on a single charter yet but it will probably happen one day. They are persistent. Bottom fishing has been brighter as we continue to catch fish there. Good numbers of Vermillion Snapper and Almoco Jack on the deep spots. Some Amberjack on the wrecks but Bull Sharks are moving in and helping themselves to hooked ones on occasion. The weather is nice once again after a dreary day of light rain with the latest front. Almost hot but the breeze has been coming up just enough by early morning to take the edge off and make it pleasant offshore.